Vision London took place over 2 days, 7-8th June, at Olympia in West London. The main theme for the show was ‘the future of the built environment’, which offered visitors the chance to see cutting edge products and technology from across the industry, and attend a range of free educational seminars from manufacturers and top architects. 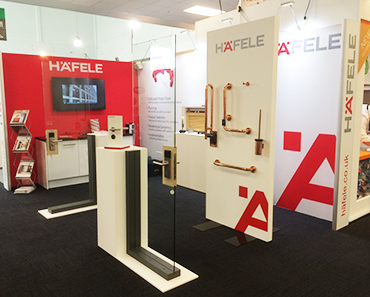 Häfele exhibited with our in-house specification team for the first time, showcasing a number of new products from the brand new Architectural Hardware catalogue. 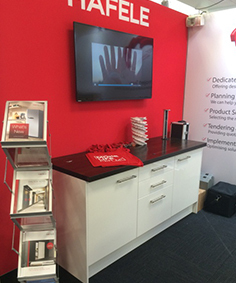 One of the benefits of this Architect, Specifier and supplier event was that our experts were able to offer a more personalised service to visitors. The Häfele project team is equipped to provide advice and support to customers at every point in a project, with over 20 DipGAl qualified staff committed to helping our customers get the most out of their projects. Gary King, Specification Sales Manager, delivered a highly anticipated seminar on “The What, Why and Where of Sliding Door Gear”, taking attendees on a journey through the types, advantages, specification and installation of one of Häfele’s most popular product categories. 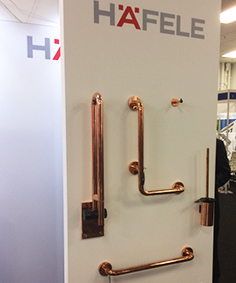 The product range which attracted the most attention was our range of anti-bacterial copper rails and handles, which are a high-end access for all product which is very new to the Häfele catalogue. 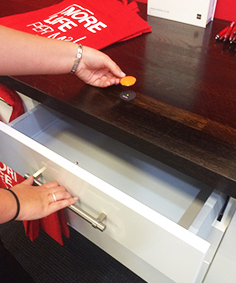 Other popular products we featured included the Rustic Sliding system, Dialock and Hawa Frontfold sliding shutters. To make sure you don’t miss out on visiting us at the next Trade Show, follow our social media channels for exclusive updates.